Every plate has a story. Yes, seeing a license plate from far away is a reminder we’re all tied together from the edge of our driveways to the edge of your driveways. Dusty towns, big cities, open fields, and tree-lined lanes may lie between us… but the truth is we’re all in this together: bouncing in cars, swerving down roads, spinning in place, flying through space. Wow! The awesome is spreading… The Book of Awesome is now officially a bestseller! Also, the 1000 Awesome Things song by Collin Rainey is now on iTunes! i love it. once i see it im all license plate game time! I do LOVE this! I know it’s not far from YOU, but I love seeing Ontario plates in Missouri. Or Alaska, wow. Once … I saw Hawaii. For real. Yes….a very big congratulations are in order! Welcome to Hawaii. How did you get here by car? Obscure quote from Whose Line? Yay, Cary! I didn’t think anyone but Mike Dover would get that one! Also saw a Hawai’i once in Cape May, NJ during a HUGE bird and butterfly migration. Also saw a polar-bear shaped NWT plate that same day. That was the coolest. Yes! I had that when I was with my parents driving through Columbus, Ohio to visit my brother. We saw an Ontario license plate BUT EVEN BETTER it was from a dealership just down the street from my parents place! It was real awesome, and real awesome to see my mom getting so excited. My dad honked and waved as we passed. It was a pretty amazing moment. I love playing the game on a long road trip where you try and find all 50 states. it’s great. I’m in Virginia and it’s always a shocker to see Alaska and Hawaii. DC has its own plates?! I know this is a year late, but I’m from Nebraska, and I’m wondering what you think of the new yellow plates? I also love playing the license plate game.. I’ve had a running list since May 21st, 2010 and I’ve got 41/50 states. This is great! I was amazed at the number of out-of-state plates I saw while I was in Hawaii! I guess a lot of people have licensing brought over. But it’s still funny to see. I love the License Plate Game! I’ve seen all 50 States and 4 Canadian Provinces. I’ve even seen Hawaii…in Upstate, NY. I live in Upstate NY too. I saw Alaska and Hawaii in the parking lot of my community college- on the same day. AWESOME!!! Hawaii’s had a rainbow. Even MORE awesome… seeing a license plate from your hometown when you’re really far away. Instant bond with whoever is in that car… they seem to carry a part of your heart with them. Absolutely. Once in Middle School I was on vacation with a friend in Myrtle Beach and saw a car with not only my tiny Kentucky county’s license plate, but also the dealer decal of my dad’s even tinier Chevy dealership. Now that was super cool. Also great- maybe better even– was this one time a few months ago when I saw someone with a sticker on their car from my small Ohio college! No one here even usually knows what it is! Yeah! Seeing a home-state plate when you’re far from home is awesome! I agree! I always want to get their attention and ask them if there’s anything they need help finding or tell them some local thing they should check out…..
Alex-Anna, I was just going to say the exact same thing. Awesome. I think this one is a little off. I never get excited seeing far away license plates. However, if I am really far away from home and see a LA plate of someone wearing Saints gear I go nuts. I’m not the only one either. Here in DC I get honked at and talked to at red lights all the time by fellow Who Dats bc of my New Orleans bumper sticker. That’s AWESOME! I remember the first time I saw an Alaska plate, when I was in Michigan just after I hit the double digit age mark. I was astonished. 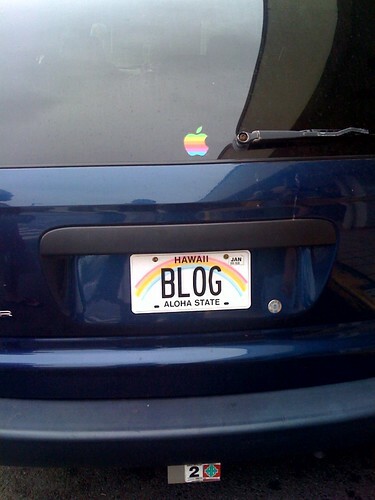 To this day, though, I believe I have yet to see a Hawaii plate. I envy you all. Goodness, I’m slacking. Must be finals week…sigh. Aww … finals. Good luck. For this week–and this week only–we’ll let you slide. My only final is a potluck dinner at my professor’s house. Yessssss. Life in grad school is so rough. But thank you for the wishes. One down, two to go (both on Thursday), so I have a bit of a break. I’m sorry, you’re right — that was so mean of me to say. I’ve paid my dues, though, and I guess she’s taking it easy on us since we’re graduating the day after the final. Oh good luck on finals! Hope yours aren’t as brutal as mine were. I’m already onto my next semester of school. I think I need to start keeping a list of the plates I’ve seen. I don’t remember seeing a Hawaii plate, but now I’m not so sure. I do remember seeing an Alaska plate though. This one is both appropriate and funny. Adorable! The rainbow Apple sticker is the perfect complement. My friends and I like to guess where the cars are from before we see the plate. I’ve done that before. It throws you off, though, when you’ve got a lot of states figured out and then they CHANGE their license plates! I hate it when we see the plate and can’t tell where they are from. Some of those plate holders cover up the state name. I live in a small town in southern Vermont. I have a goal to take a picture of a license plate from all 50 states, DC and the Canadian provinces in my small town. I would have thought Hawaii and Alaska would be the hardest, but I got them early on. I then decided now that the gulf states, Alabama, Louisiana and Mississippi would be hardest. Oddly, the ones I haven’t taken yet are the New England states, NY and NJ, because they are just too easy. The best license plate sightings I have ever had were a New Hampshire in Playa del Carmen, Mexico and Puerto Rico south of DC. same here! it always makes me so happy. especially when they are from nearby my hometown. This game never gets old! I still love to see visitors from other provinces/states bombing it down our highways. It’s fun to work out personalized plates too. I enjoy Licence plate stories. Seeing different ones makes me smile : Whether, they are from another state or have a specialized picture or writing on them. More than that, today, I am so EXCITED that ” The Book of Awesome” is on the bestseller list. Looks like we all have good tastes. Ohh, I didn’t understand this one until I read the comments. I thought “seeing a license plate from far away” meant seeing it from a distance, as opposed to close up. I was thinking “well, I guess squinting is cool”. considering the image at the top…it made sense to think that. We always play the license plate game on road trips, but often play it for the numbers or letters (ie, whoever finds all the letters of the alphabet first is the winner). It is awesome. And when I was a kid, I always got goosebumps when we were out driving on big event days, like a holiday, because I knew everyone around us KNEW it was a big day (even if they didn’t celebrate it), and so we all shared the day in common. One of the few (and I mean VERY few) iPhone apps I have actually paid for is the license plate game app. I keep a running total all year. In 09 I found 45 states and DC. Maybe this will be the year I find them all! Conversely, it’s super cool seeing a license plate from your home state in a faraway place. It happened my freshman year of college. Imagine the awesomeness of seeing someone from Delaware (who also happens to live in the next neighborhood over from you) in Bleeker, Alabama. This is what I was just about to say! I’m from Washington state, go to school in Indiana, and was visiting a friend in Ohio when I saw a WA license plate in a parking lot. All of a sudden I felt connected to my home, half the country away! I was out on a first date with a guy I’d been eyeing for a while and we made small talk as we drove down a large interstate. I mentioned that I’d never seen a license plate from Hawaii and he said he hadn’t either. I’m not making this up – two minutes later, we saw one! What a cool memory. OK, can I just ask a question here? Why are Hawaiians taking so many road trips? I mean, seriously, you LIVE in HAWAII. People dream their whole lives of visiting your state. Why you leavin’ it? Alright, and I guess I have a follow-up question, too: wouldn’t it be cheaper to rent a car on the continent than to ship your car from Hawaii? This is a real conundrum. Road-tripping Hawaiians! Please explain yourselves! I KNOW! I thought it was a REALLY rare sighting that I’d had, but it turns out I’m very much mistaken. Apparently it’s a lot more common than I’d ever have guessed. Your questions are valid. I went to Hawaii once. I practically had to be picked up and carried onto the plane because I didn’t want to ever leave. I’m also curious if the reverse is true. Is anyone here from Hawaii and can confirm whether or not you see very many license plates from continental states driving around Honolulu? I’ve been trying to think ALL DAY if I could remember seeing any out-of-state plates in Hawaii, but I really can’t remember. Boo. I remember when I was in high school I saw a Hawaiian license plate in a small town in Mexico. We were at the reservoir and I found out that the people from Hawaii were rappelling down into the canyon. I will never forget that license plate!! My favorite as the resident of a “destination” state (Arizona) is seeing plates from my home state of NY driving around my new hometown. Even better than that is seeing the car-company-identifier-license-plate-frame around a NY license plate with the name of the company that I bought my first car from. Awesome! Like having a piece of “home” in my NEW home. Always makes me smile! LOVE this site, and I can’t wait to get your book! I took a road trip to Ontario, Canada with some friends a few months ago, and I remember wondering what went through people’s minds when they saw our New Jersey license plate. Whenever I see I license plate from really far away, my imagination kicks in and I start to fabricate little scenarios for the travelers. In my mind, I create back stories that lead up to why they’re in the area, to what they’re going to do while they’re in town. It may sound silly, but it puts a smile on my face and makes my day AWESOME. I really love this one! It reminds me of long hours spent in back seats covered in juice and crumbs, and the different stages we all go through. Thanks so much! Between my University and working at Disneyland for 3 years, I’m pretty sure I’ve seen every single license plate. I just love this post! This is a good one, I’m here in Texas and have seen an Hawaii plate before. I almost couldn’t believe someone from all the way out there would come to my little town. Living in SD, the non-CA license plate I see more than any other is actually a Mexican license plate. I guess that’s what happens when you live 15 miles from the Mexican border and about 250+ miles from our closest state border. A buddy of mine was stumbling around drunk in the parking lot of a ski resort in Austria. He found a car with an Ontario plate (his province) with a Blue Mountain ski club sticker (his club). He spent the rest of the night trying to find the owner. Or at least he thinks he did. I was just going to say the same thing. I live in a suburb in IL and while vacationing in FL we saw a car pull up next to us with the license plate from of the dealership down the street from our house….awesome! Or BEING really far away and seeing a license plate from YOUR hometown! I like that even more! This is wonderful. I look forward to reading about all that is awesome! I love this! I always get excited if I see a far-away license plate. But, whats even better is being somewhere really far away, and I mean FAR and seeing a license plate from your home state. When I was in Belgrade, Serbia last year, we went to see this huge church. As we were walking away, we spotted a Pennsylvania plate and we totally flipped! I think we saw a PA license plate in Prague, too. I find comfort when I’m far away from home and I see my home state license plate. Or the county listed on the plate. It makes me feel connected to that person for a brief second as they drive by. I think what a small world that we are both here far away from home. I’m from New Orleans but I live in San Diego and I LOVE when I see Louisiana plates. It’s even better when they have a ‘WHO DAT’ sticker. Ahh love!! This is just fantastic. Thank you. Made my day. About 6 months after 911, I had a rental car in Michigan with New York license plates (so many business travelers like me had had to drive home when they couldn’t fly, that a lot of cars were ‘displaced’ for a long time). It took me a while to understand why everyone was honking and waving. Once I figured it out it was so awesome to realize how much that event made us remember we are one country. I was so proud of everyone. Also, I find it even more thrilling when I see a license plate from my home state now that I’m up here in Ontario. They’re very few and far between. Seeing a license plate from your home town when you are really far away! I really want to dedicate this one to “Colorado”. We only drove through the same highway 79 stretch for about 45 minutes about 2-3 years ago and I still get excited whenever I see the license plate (especially if it is an RV) thinking it might be you again. I know I was sort of hateful during our encounter but it was only one lane available and couldn’t pass you as you drove 30 miles/hour… but when you left, I felt a gap, we were connected and that was… AWESOME! I find it equally awesome when I’m far from home and see a license plate from my home state. Add to the awesome factor if you find out the folks are practically your neighbors!